Hot and windy test conditions made for rather disappointing numbers. 0-100 mph was achieved in 9.7 seconds (the best I have seen is 9.1 seconds). 110 mph: 11.6; 120 mph: 14.2; 130 mph: 17.1; 140 mph: 20.7; and 150 mph: 25.9. Any chance a mod will approve my adding the 0-150 mph and top speed from the Car and Driver test? Here is the link: http://media.caranddriver.com/files/2013-ford-mustang-boss-302-laguna-seca-instrumented-test-review-car-and-driver2013-boss-302-laguna-seca.pdf Thanks. The test sheet says that it was hot and windy. Not the best test conditions for top speed. They reached 165 mph going North, and only 157 (against the wind) going South. Aerodynamic physics says that tail winds don't help much, but head winds are really detrimental to speed. So if they reached 165 mph on a hot day, then that is the top speed for that test. I disagree with averaging two directions. 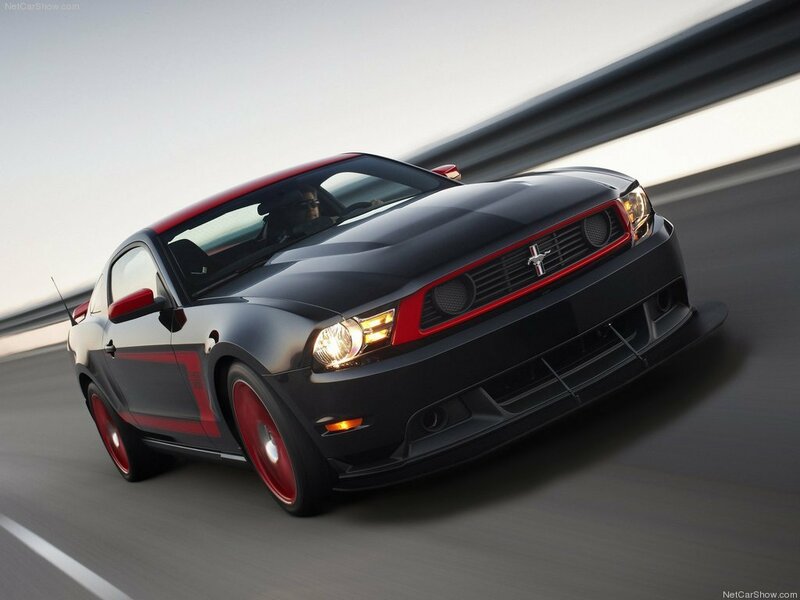 Another problem for the Mustang is sixth gear only allows 5100 rpm at 165 mph. 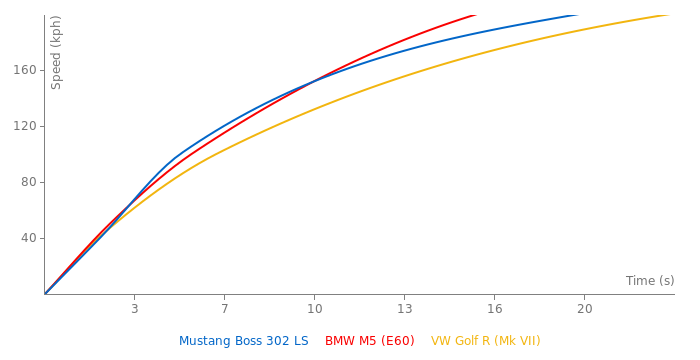 At that rpm the Boss 302 has no more hp than the standard GT, and is way off from its peak. S; It's actually 160mph and that would be for the convertable, not the coupe. It was limited for safety reasons. Did you know that the top speed is limited to 155mph? The March issue has a pretty good article on the '13 GT500, focusing on the engine most of all. Of particular note, with respect to a shot of the dyno computer screen: "The 650 HP rating is at the maximum continuous RPM of 6250, but the redline is 7000, at which point we saw 670+ HP on the screen. But Ford probably doesn't want you to know that." Ford themselves said that it will have 650hp. @SOHCammer do you have a source? The sources that I have consulted all say the 2013 Mustang Shelby GT500 will have 650 horsepower. I haven't seen 670 hp quoted anywhere. The long time rivalry between Camaro and Mustang has now expanded from a horsepower war into a handling war. Sure the ZL1 has an impressive 580 hp, but the real news is the magnetorheological shocks and fine suspension tuning. The rivalry is improving both cars. We get it DirtDickler, you have an irrational hatred for a reasonably good car. Move on already. Also, as much as I love the Boss 302, it's kind of hard to call the ZL1 a clown car with some of the eye-brow raising paint schemes offered for the Boss. There's only two laptimes of the ZL1, the Nordschleife and Inde ranch, and the last one is where it was tested against the Boss, the other time you saw of the ZL1 being several seconds slower was on Laguna Seca where someone wrongly put the Inde rach laptimes as if they've been done there. Seeing as the ZL1 has +140HP over the Boss 302 and despite the MASSIVE power deficient the Boss 302 is just 1.45 sec behind. Regardless I would beat anything the Boss 302 is much more fun to drive vs. that boat / clown car Camaro. The new GT500 it's real competition is going to destroy the ZL1. 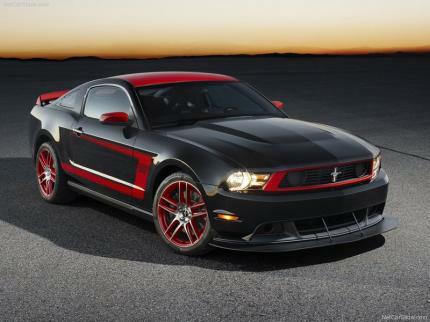 Still I'd probably take the Boss 302 as the best over all package. @Viking WooHoo! One track it beat the BOSS LS on. I noticed how the ZL1's time was removed from the LS time list, interesting that the BOSS LS posted a much faster time than the ZL1 there. But I digress, in order to really compare the two to see who's a better track car, we need to see them post more times on more tracks to compare. I would, for one, take the ZL1 as my daily driver over the BOSS. Thanks for this one.. Anyone out there still got old SnB tapes (or any other shows), go see us at the T.R.O.Y. forum. For the past year and a half we’ve been doing what we can to upaold and archive as many full SnB shows as possible. If heads have no means to digitize, we’ll do it for you and get you your tapes back. Peep the Stretch and Bobbito blogspot to see what we’ve already got done. Good things going on.. Thanks again for this. @GriggsRacing The ZL1 certainly is a killer. It slaughtered the Boss 302 LS on the Inde Motorsports Ranch track. @phavyarden I finally posted the new lap times. I hope Motor Trend tests some other cars at this track, so we can compare them. It's a shame that there's no more lap times of that track for make a comparasion with other cars :/. In the March 2012 issue of Motor Trend they had a comparison test between the Boss 302 LS and the Camaro ZL1. Surprisingly, the Camaro won. I need to add a new track: Inde Motorsports Ranch, a 2.2 mile track in Wilcox Arizona. The Boss ran a 1 minute 43.74 second lap and the ZL1 ran a 1 minute 41.29 second lap. Randy Pobst was driving. @Dirtdickler I think that the Sport Auto test of 16,8 seconds for 0-200 kph is correct given their test procedures. I think some other tests in Germany with a fully broken in example will prove to be quicker, but 16.8 isn't all that bad using their techniques. The 1 Series M coupe is not quicker than the Boss 302. The 1 Series M coupe tested by Sport Auto got a 17.2 second 0-200 kph. Comparing cars here makes NO SENSE whatsoever if they aren't ALL tested using the same procedure. Ignorant post?? WTF are you talking about? How do you not comprehend? If the car can run 0-120mph in 13.0 how in the hell is 16.8 accurate for 124??? AGAIN it makes no sense period and makes NO SENSE to compare cars when different methods are used! So how is my post ignorant again? The Boss 302 blows the doors off the BMW 1M coupe in the 1/4 mile, 0-120mph but somehow the BMW 1M coupe makes a MASSIVE come back by 124mph can blows the doors off the Boss 302?? Sorry this isn't happening in the real World my friend. Use a bit of common sense...It goes a long ways. reading help no matter how often you repeat your ignorant postings..
No 1ft roll out, no dragstrip, passenger, car from a dealer so possibly not fully broken in, this has already being explained before and is still on the first page. I rest my case. When something is WRONG it's WRONG no way around it. Yeah that 16.8 sec 0-200kph time is OBVIOSLY WRONG. Makes NO SENSE that it would be about 2 full seconds behind the BMW 1M coupe! It's ALOT faster than the BMW 1M coupe. How does a car that takes just 12.3 sec to reach 117 take 16.8 sec to reach 124.27???? NO SENSE WHATSOEVER. I garantee if you lined up a BMW 1M coupe and Boss 302 and ran them up to 124.2mph the Boss would INFACT blow the doors off the BMW. So with this abundantly aparent why is that bogus / WRONG time of 16.8 sec still listed?? I noticed that the boss came in a little over 3minutes at VIR...What could be a good estimate for the Nurburgring? Would it crack 8mins? Or would it need to top out at over 155 to do so?